Local Fast Undercar warehouses stock complete lines of top quality parts. Professional Installer Customers receive instant price and availability information via telephone or EDI. Order fill rate is consistently greater than 97%, and delivery is IMMEDIATE via Fast Undercar vehicles. 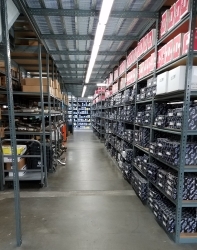 Fast Undercar was founded in May 1996 as a wholesale distributor of automotive aftermarket undercar parts to professional installers of all types including national auto repair chains and independent auto repair garages. The Company adds value with its immediate delivery system. Fast Undercar is a privately held corporation that currently owns and operates locations in southern California. With consistent growth in the automotive aftermarket and Fast Undercar's reputation as a leader in the industry, Fast Undercar launched its franchise program in July of 1998. Today there are currently locations in California, Oregon, Washington, and Idaho. SUPERIOR SERVICE - Knowledgeable and Experienced counter persons that are committed to delivering complete customer satisfaction. QUALITY PRODUCTS - Fast Undercar sells only top quality products from the leading automotive manufacturers. Click here to see the list of manufacturers we currently carry. NO LIMITS WARRANTY - Every part Fast Undercar sells is guaranteed to deliver 100% customer satisfaction. IMMEDIATE DELIVERY SERVICE - ALL orders are delivered immediately using Fast Undercar's fleet of delivery vehicles. Built on the strength of creative and motivated people, Fast Undercar is committed to being the premier supplier of quality automotive products to professional installers and providing the highest levels of customer service.